SYSSS Week 8 - Round and Round! Welcome to Week 8 of our Scrap-Your-Stash Summer Saturdays! Thanks to all who took the challenge to use 3 photos and 3 different patterns last week, and added your layout photos to the album on the facebook page! If you're just joining us, this is how it works: Each Saturday until September 8th I'll provide you with the theme of the week and a checklist of supplies. You'll "shop" your supply stash and choose the items and photos that you want to use. Substitutions are encouraged: if you don't have or don't like a suggested item in your stash, switch it up for something you do have/like. For example if you absolutely hate floral papers, sub in a striped or other patterned paper, cardstock to coordinate and some geometric embellishments. It's totally up to you! All that's left to do once you've chosen your items is to create and share! (Note: feel free to use ANY brand of supplies - you do not need to use Creative Memories...although that's probably what you'll see in my layouts ha ha!) Alright...are we ready for week 8? We're going round and round this week...using a BIG circle as our starting point! I always been drawn to layouts that featured shapes arranged in a circular pattern, and with good reason - the circle is one of the best ways to make sure the viewers eye takes in the entire page. Creating a large circle shape on your page and then filling it in or outlining it with a variety of repeating shapes is also a great way to use up scraps! I've got a sample sketch for you below that you can use as a starting point, but you can also check out the amazing layouts I've gathered on our Pinterest board for this week for inspiration! Start by tracing or drawing a large circle on your layout base with pencil. Crop a few photos down to 4" x 4" or 3" x 3" size and adhere them on opposite sides of the circle (ie: think 10:00 and 4:00 on a clock face) or, stagger several photos all the way around. Then punch a bunch of shapes from different papers and fill in the gaps around the circle. You could also use up a whole schwack of die cuts or stickers to fill in the gaps! 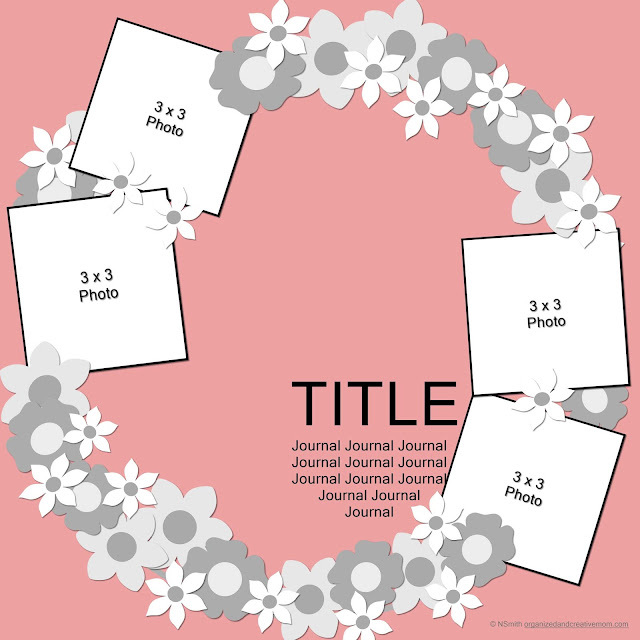 Finally, add a title and a bit of journaling in the centre or near a cluster of photos to finish off this high-impact layout! SYSSS Week 9 - It's a Banner Week! SYSSS Week 7 - 3 'n 3!